Muhammad Ali in 1967, seven years before the George Foreman match in Kinshasa. 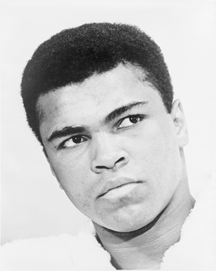 At the time of the match, experts considered Ali's strengths to be speed and technical skill. Foreman, a gold medalist in the 1968 Olympics, was considered dominant in power and size. Moreover, since at 32 Ali was a week short of seven years older than Foreman, Ali's strengths were considered to be fading on account of age. Although Foreman was heavily favored, Ali defeated him by a knockout. It was Foreman's first defeat, and it remains his only loss by a knockout. Photo by Ira Rosenberg, a staff photographer at New York World-Telegram and Sun. It is part of a collection donated to the U.S. Library of Congress, Prints and Photographs division, under the digital ID cph.3c1543. In organizational politics, most attack strategies assume accurate predictions of the defender's response. Since unsophisticated attackers tend to leave options open for defenders, finding suitable defense strategies is relatively straightforward. But sophisticated attackers usually try to gain control of the defender's choices to reduce uncertainty about the outcome. The sophisticated attack is therefore the interesting case. For sophisticated attacks, unexpected responses are preferable. One response that's often effective is "rope-a-dope." The term was first applied to Mohammed Ali's strategy in a boxing match with then heavyweight champion George Foreman, on October 30, 1974, in Kinshasa. After letting Foreman tire on the attack, Ali won by a knockout in the eighth round. The strength of "rope-a-dope" is its focus on the long time scale. Foreman was thinking on the time scale of the jab or punch, or at most, several combinations. Ali was thinking on the time scale of several rounds. Ali's strategy was to withstand blows while Foreman exhausted himself, and then switch to offense. In organizational politics, attackers tend to focus on the same time scale as their attacks. They try to control the defender's immediate response options, emphasizing especially those responses that could harm the attacker and eventually give the defender the initiative. A rope-a-dope response to political attacks first emphasizes withstanding the attacks long enough to render the attacker incapable of effective defense. Only then does the defender go to the offense. For example, suppose Hannibal, the attacker and more powerful, is the leader of H-Division. Hannibal seeks to acquire C-Division, headed by Clarice, the defender and less powerful. Hannibal intends to terminate Clarice, and then install policies that decrease sales of C-Division's products, some of which embarrass H-Division because of their superiority. Defenders usually try to make the most cogent rational case for retaining the status quo. Because logic is less effective than political power, they rarely succeed. For instance, the attacker might have prepared the ground by having pre-positioned persuasive rational arguments — sometimes based on misrepresentations — outside the defender's awareness. time scale as their attacksdetection of the attacker's pre-positioning of rational arguments for acquiring and eventually dismembering the defending organization. Using this knowledge, adjust C-Division's activities, and prepare — but don't deliver — counterclaims and refutations of Hannibal's claims. Produce a product that's based on strong customer relationships, and which cannot be replicated outside C-Division, because it depends on the division's continued existence, intact. This ploy secures organizational longevity, even if H-Division acquires C-Division. After the acquisition, when Hannibal's exaggerated claims are beginning to crumble, release the previously crafted refutations and counterclaims. Would you like to see your comments posted here? rbrendQcFXrRbGlNkuQsnner@ChacLhmTudUTMzWUMxgvoCanyon.comSend me your comments by email, or by Web form. By now, most of us realize how expensive meetings are. Um, well, maybe not. Here's a look at some of the most-often overlooked costs of meetings. When things go wildly wrong, someone is usually designated to investigate and assess the probability of further trouble. That role can be risky. Here are three guidelines for protecting yourself if that role falls to you. I offer email and telephone coaching at both corporate and individual rates. Contact Rick for details at rbrenhshSubSxqUgFRISGner@ChacdkVKpjWYSxCVrqMcoCanyon.com or (650) 787-6475, or toll-free in the continental US at (866) 378-5470.